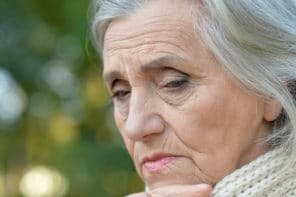 Is your older adult aging “normally” or are the changes you’re seeing signs of a disease or something else you should worry about? Knowing about common changes that happen to most seniors helps you understand the normal aging process and gets rid of those worries. These are 4 areas where you might see changes in your older adult. A common misconception is that being incontinent is a normal part of aging. That’s not true! Incontinence is often caused by treatable conditions like urinary tract infections (UTIs), constipation (who knew!? ), and medication side effects. If your senior starts having incontinence issues, it’s time to talk with the doctor to find the cause of the problem so it can be improved. There are normal changes though. Bladder muscles get weaker with age. That’s why it’s easier to leak urine (when sneezing and laughing too hard, right? ), but that’s definitely not the same as becoming incontinent! It’s also normal to have to pee more frequently because older bladders can’t hold as much urine. For men, enlarged prostate (BPH) is a common condition. The prostate grows and squeezes the urethra, making it difficult to pee. This is an important one! The risk of falling does increase with age. This is because of changes in vision, hearing, muscles, and balance. Having medical conditions like diabetes or heart disease also increases the risk of falling. Common side effects for many medicines are dizziness, weakness, or loss of balance. Nothing will set someone up for a fall better than that! Falls don’t have to be a part of aging though. Regular exercise, a healthy diet, minimizing medications, and getting regular vision tests go along way to preventing falls. Changes in sleep and circadian rhythm occur as we age. Seniors will probably sleep less at night, and probably won’t sleep as deeply as they did when they were younger. And it’s more likely that they’ll wake up during the night and/or wake up earlier in the morning. Click here for more about sleep problems and get tips to improve your older adult’s sleep. Older adult skin is thin and fragile. Skin infections or pressure sores can develop rapidly. The best way to prevent skin breakdown is to stay clean, dry, and moisturized. Seniors are also more likely to get shingles. It’s a disease that affects nerves and causes pain, rash, and blisters. It’s caused by the same virus that causes chickenpox. About one in five people who’ve had chickenpox when they were kids will get shingles after the age of 50. — Bathroom Safety for Older Adults: Grab Bars and More!